The city is officially starting to get prepared for the upcoming holidays and one of the most highly anticipated events of the season is the annual Toronto Christmas Market. Now in its ninth year, the Toronto Christmas Market is back and bigger than ever, as it will be kicking off the holiday season even earlier this year by opening its doors on Thursday, November 15. But the Christmas Market wouldn’t be complete without its iconic 50-foot Christmas tree, which will officially arrive at the Distillery District on November 2 to mark the beginning of its transformation into Toronto’s favourite holiday destination. Donated by Forests Ontario and Ontario Wood, the Christmas tree will be decorated with 40,000 glowing lights, 800 Christmas ornaments and a whopping 1.5 km of gold ribbon to make the tree glisten with holiday spirit. In addition to the stunning Christmas tree, the market will also feature entertainment, beer gardens, vendors, and a whole lot of Christmas cheer. 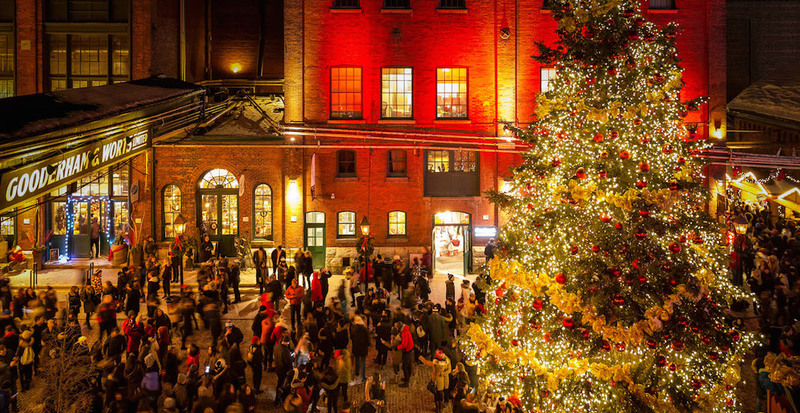 So get cozied up, and head down to the Distillery District to experience its holiday magic. When: Thursday, November 15 to Sunday, December 23 – *closed on Mondays.